This film is a trendsetter of sorts, in the sense that it does not have one story but is a combination of 10 stories, each one of which is different. Music-wise, too, it is a first because the album comprises not two but three CDs. To that extent, the makers are not wrong when they call it "the biggest album of the year". But if they make that claim quality-wise, they don’t have much ammunition to back it. The main CD is the Dus Kahaniyaan Lounge, which has 10 songs. Six of these are there in reprised versions in Dus Kahaniyaan Club. The third CD is of Gulzar’s poems recited by various actors like Naseeruddin Shah, Nana Patekar, Dia Mirza, Manoj Bajpai, Amrita Singh, Anupam Kher, Sudhanshu Pande, Neha Dhupia and Sunjay Dutt, who star in the film. The music of the film has been composed by Gourov Dasgupta and most of the lyrics have been penned by Virag Mishra. The film gives a chance to many fresh singers. The title song has been rendered by Anchal and KK and is enjoyable in both versions. In Aaja soniye, the male lead singer is actor Sudhanshu Pandey, while the female voice is that of Shweta Vijay. Both have sung with confidence. Anand Raj Anand has contributed two songs—Bin tum and Bhula diya. Bhula diya has been sung also by Anand Raj Anand and is about the best song of the album. So has Shafqat Ali Khan— Vichodeye ne and Kaala Peela. One is by Bappi lahiri—Mushkil kushaa. It is Gulzar’s poems which are the most enjoyable part of this package. Surprisingly, these have been rendered very well by all actors, with Naseer being outstanding. Perhaps that is why he has been given the honour of rendering two of them. The festive season around Diwali is the time of prayers. Times Music has come out with several albums to fulfil this need. 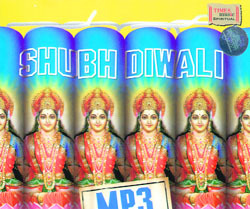 Shubh Diwali is an MP3 album comprising five hours of prayers. These include Surya Prarthna, Tulsi Stuti, Lakshmi Dhyaan, Kuberstuti, Mangal Kaamna, Deep Poojanam, Ashtalakshim Strotra, Deepdanam and many other mantras and strotras. These have been rendered by Usha Mangeshkar, Anup Jalota, Anuradha Paudwal, Kavita Krishnamurthy and Suresh Wadkar. The second album, Lakshmi-Ganesh, is in honour of these two deities and has been sung by Lata Mangeshkar, Asha Bhonsale, Jagjit Singh and others. In fact, it is a combined worship of five deities: Lord Ganesha, Lakshmi in her three forms as Mahalakshmi, Mahasaraswati and Mahakali and Kubera, the treasurer of the gods.